The basis of the art of flower arrangement is ikebana. Meanwhile, the language of flowers existed not only in Japan. Many peoples of each flower was a symbol, using the bouquet was not only to declare his love, but to declare war. Modern arrangement of flowers carries such a serious meaning, it is primarily beautiful and original. For compositions of flowers is better to cut themselves. Then you will firmly believe that the plants are fresh and not processed in any composition. Use a good sharp knife. Cut plants are better in the early morning before dew or late in the evening when the sun had set and the heat subsided. Tear off or cut the lower leaves. From the lilac, wild cherry and other colors with durable laminate branches cut. 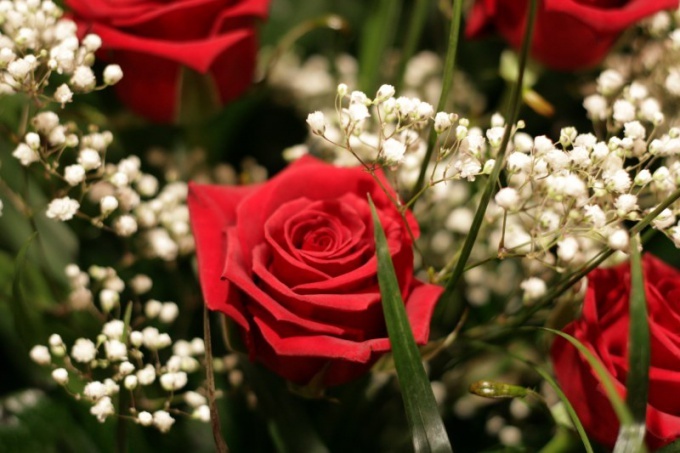 If you are going to include in the composition of roses, trim the thorns. Pour into a large bowl or in a bath of cold water and put flowers. Make sure that they sank almost completely. Anyway, the stems must be in water, even if the flowers remain on the surface. Capacity is best put somewhere in a cool place for a couple of hours, so that the pelvis is still preferable. Remove the flowers from the water and trim the stems a little. If you have cyclamen, chrysanthemums, or carnations on the lower part of the stem cut to 2.5-3 cm Stem plants that produce a milky juice, omit the first few seconds in boiling water and then immediately in cold water. They can be annealed. Such plants include poppies, dahlias, peonies and some others. Sort the flowers by type and length of the stem. Try to have one group of plants was approximately the same size. It is preferable to make the composition, if only three groups, with the shortest stem equal to half the average, and the average - half long. But there are other possible correlations. For the preparation of the composition you will need the basis. This can be the most ordinary vase. But you can make a bouquet in the basket, in bucketize. In the latter two cases you will need floral foam and the nutrient solution. In the usual vase of flowers is usually not fixed. Simply put the way you like. Try to keep the tallest plants were in the centre, and those that are low - edges. Then all elements will be clearly visible. In the basket you can lay a plastic wrap, and put floral sponge moistened with a nutrient solution. Flowers in a basket can be quite a long time. They are attached with wires to a special frame, which can make yourself or buy in a flower shop. Very well, if you have a handy floral foam - a special device already filled in with the floral sponge. Insert flowers around the circle from the center.